A few weeks ago, I wrote about the robin that was continually banging into the windows of our house, with his beak, intentionally. Apparently, he was successful in staking his claim to the territory that he wanted, because we now have a masterpiece of mud and grass on the light next to our kitchen door. And because I do not want to raise baby robins myself which could potentially happen if someone were to scare the mother robin away by slamming the door, we will not be using the kitchen door for the next several weeks until the eggs have hatched and the fledglings are old enough to leave the nest. Welcome to my life in the woods – Bienvenue à ma vie dans les bois! It’s amazing, when you think about it, that a little bird with a tiny brain and no hands, has the ability to construct this nest. I’m not sure I could build this, even with my hands and larger brain. There is a lot of mud in it. I wasn’t sure how they transported the mud (beaks, feet, or mini-mud buckets?) but I Googled and confirmed that they do transport the mud in their beaks. What a lot of work! And the spots on the side of the house and on the light fixture that look like mud? They are mud. Just when I finished cleaning the windows from the robin banging into them, now I’ll be cleaning the siding and the light. But I’ll have a respite for about four weeks – two weeks waiting for the eggs to hatch and two weeks waiting for the babies to fly away. 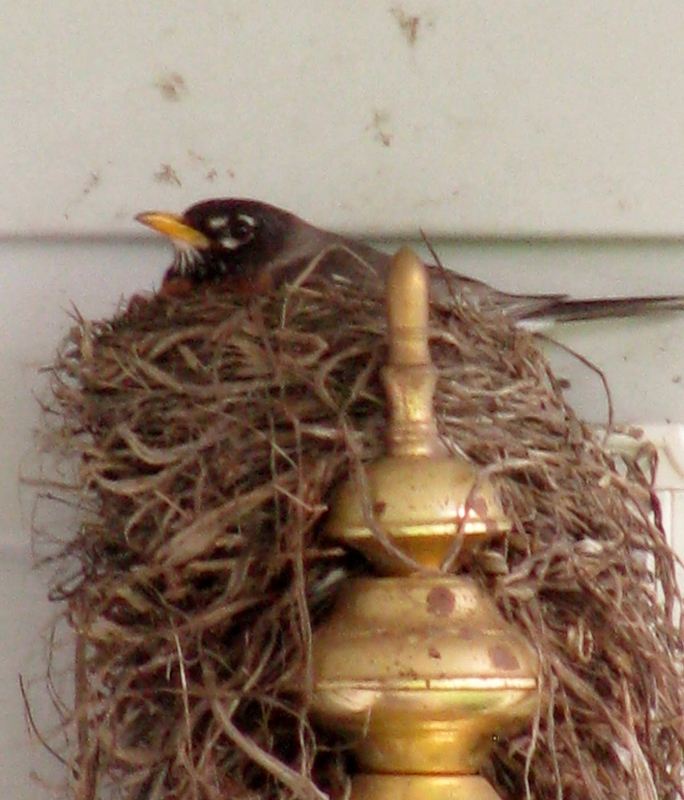 The good thing about the location of the nest is that it’s easy to access for photos. It only took them a few days to build the nest, and then there was one egg in it. And over the next three days, three more eggs. Aren’t they a beautiful shade of blue? There she is – the proud mama-to-be. Note the tiny beak that transported all of that mud. I have a zoom lens so although she is aware that I am there, I am far away and I like to believe that my presence does not bother her too much. Finally, something fun and entertaining to add to my to-do list. I’m going to sit on the deck now, to enjoy a glass of wine, and listen to the robins sing. While I’m relaxing, first, I’ll think about why I would not like to be a robin. Then I’ll think about the reasons that I would like to be a robin. I know what you mean about being the household folding expert, Denise. Fortunately or unfortunately, I am the only one who cares that we don’t look like we have slept in our clothes when we leave the house. And oh, la vache, if anyone else had to learn to operate the iron! Wonderful photos … the eggs are so blue … brilliant post – I wonder if she are … doing “ plus and con” list about humans – she probably would have laundry on her “plus list” – funny and great post again. 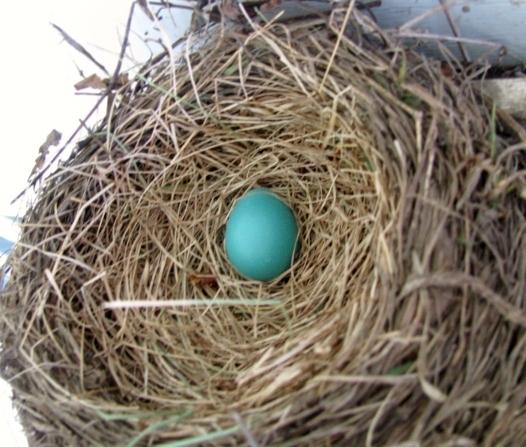 Yes, love the robin’s egg blue color. 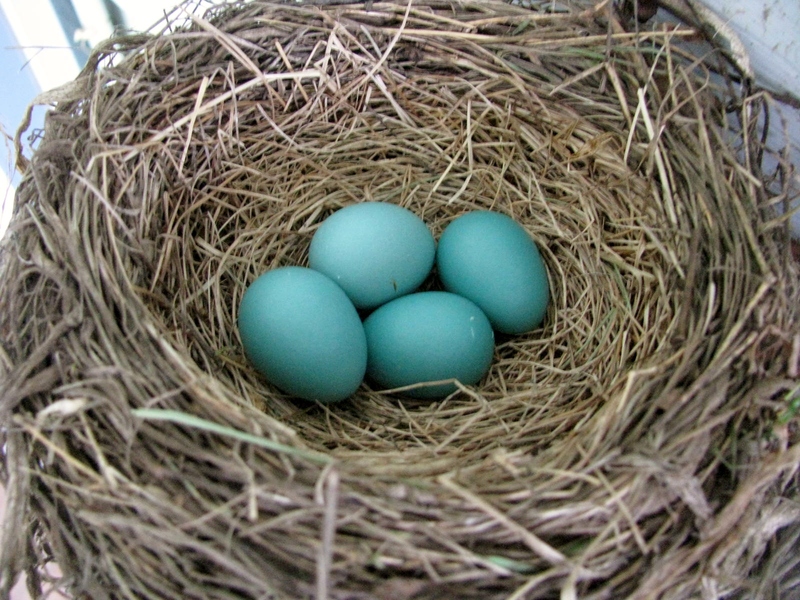 In the US, we use “robin’s egg blue” to describe that particular color. You have a great week, too. Merci! You are hilarious! Love your lists of pros and cons. And I adore Robins…I really, really do. I love their colors, their singing and their beautiful blue eggs. Thank you for commenting. Yes, I like to hear the robins sing. We have a wren house outside the kitchen window and a pair has recently moved in. They have a really beautiful song. If there are wrens where you live, I highly recommend a wren house. Merci! 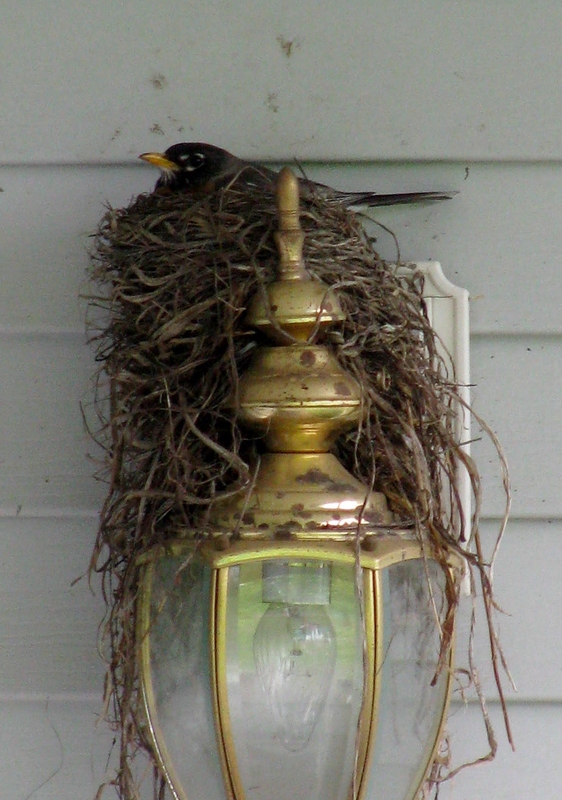 I found your picture of the four beautiful robin eggs while searching for an image of a bird’s nest. 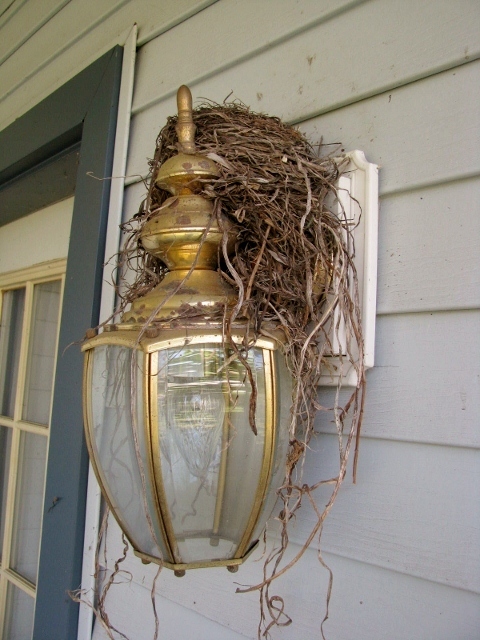 I am in the process of starting an Environmental Stewardship group at my church (St. John XXIII parish in Perrysburg, Ohio) and I wanted to have an image of a bird’s nest to use as our logo. I’m calling the group Our Natural Environment Stewardship Team or OurNEST. I am writing to ask your permission to use your image as our logo. This is a non-profit activity. We will be working to educate people about environmental issues such as climate change, doing recycling projects at our parish, working with children to take them out to natural settings and teach them about the connections between people and the environment. Nothing will be sold. Thank you for taking the time to consider my request, and best wishes to you on your blog and ventures! So glad you liked the photo and I apologize for the delay in responding. If it is not too late, please feel free to use my photo. Best of luck with your OurNEST group.